Africans ought to demand for themselves to ensure their governments protect and promote the rights of citizens, the representative of the United States of America to the African Union has said. Citizens demanding, standing up for their rights is a weapon that is used the world over, said Ambassador Reuben E. Brigety II who is also the permanent representative of the US to the UN Economic Commission of Africa. 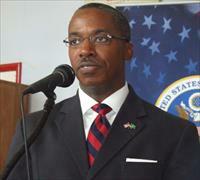 The US diplomat made these remarks on Friday during a press briefing at the American Corner, on Kairaba Avenue. He was in Banjul to attend the closing ceremony of the 56th ordinary session of the African Commission on Human and Peoples’ Rights, and to hold discussions with officials of the African Commission on the nature of human rights in Africa, and how the US can partner with the Commission in promoting good governance and human rights. He said the US will continue to advocate for justice and accountability for the people of Africa. “We owe it to the people of the continent for their right of dignity, right to development, right to their own say of how they are governed,” said Ambassador Brigety, who was a researcher with Human Rights Watch. “We will continue to work for those fundamental, basic rights for all Africans because we believe Africans share the same rights as all human beings all over the world.Sometimes that is an easier fight; sometimes it is a very difficult fight, but its one that is very central to American foreign policy because it is the centre of American identity,” he said. Ambassador Brigety said the United States will continue “unapologetically” to advance human rights in Africa and elsewhere across the world. “We never and ever will apologise for standing on the side of individuals, be they African or otherwise, for their own individual dignity and for their rights to their own life,” he said. According him, it is vital that the US continue engagement with governments in Africa and elsewhere on human rights issues. However, he said there are some governments whose human rights records are “so problematic” that such engagement can often be difficult, if not impossible. “Those governments with whom our relations are strained, are strained for very good reasons; it is because of the horrible human rights against their own people,” the US diplomat said. For example, he said, in the case of Sudan, the head of state is an indicted war criminal by the International Criminal Court because “he has been complacent in the killing of 100s of thousands of his own people, not American but Africans”. He said the United States-Africa Union strategic partnership is based on four pillars:partnership on democracy and good governance in Africa; private sector economic growth, trade and investment; peace and security, and opportunity and development. “The reason democracy is the first pillar is because everything else for the African people’s prosperity depends on the advancement of democracy and good governance, and it is an important component of strengthening human rights in the continent,” Ambassador Brigety said. He added that the US wishes to advance these policy goals through the African Union, a body that exists to advance the dream of peace and prosperity throughout the continent. In 2006, the US became the first non-African country to establish a separate diplomatic mission to the African Union. “We took this action in the interest of advancing democracy, peace and security, and the fundamental rights of a free people,” Ambassador Brigety said.